This has been a busy week and since it’s not yet St Paddy’s Day, I’ll catch people up on a couple of tours I took. Lovely, isn’t she? 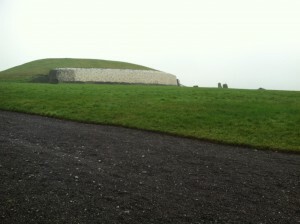 Newgrange is a mass burial mound and one of the earliest solar observatories ever built. It’s older than the Pyramids by about 500 years, and older than Stonehenge by about 300 years. 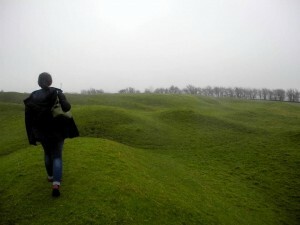 It’s old and it’s very, very beautiful, situated in the Valley of the Boyne (a river that runs through Ireland and was the site of a major battle… There’s a ton of history in this country, it’s amazing) and one of three enormous earthworks/burial mounds/solar observatories. The other two are called Dowth and Knowth. Dowth is only partially excavated, and is set up so that the sun passes through the entranceway at sunset on the winter solstice. Tourists aren’t allowed in Dowth. 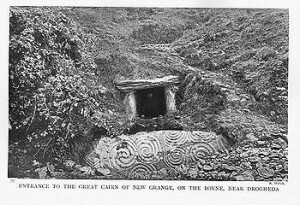 Knowth is bigger than Newgrange, is excavated (though also not open to the public), and is set up so the sun shines into it on the equinox. Newgrange is open to the public (sadlly, you can’t take pictures in there) and is set up so the sun shines into its cruciform chamber at sunrise on the winter solstice. 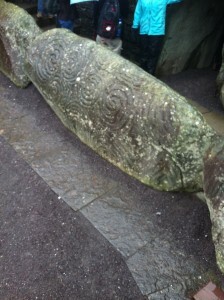 This stone saved Newgrange. The hill was going to be dug up in 1699 on the off chance that there was stone in it, but when the workers started digging, they happened to dig directly into this stone with the swirly markings. This is a picture of the excavation, courtesy of Wikipedia. Anyway, it was a very lucky break. 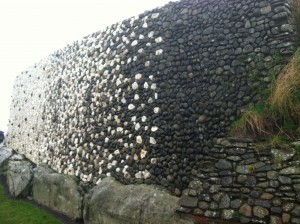 Oh, and if you’d noticed, the front of Newgrange looks about fifty times better than this. It’s all white stone and pretty curves, what’s with that? Did they clean it up for tourists? Nope. That’s how it originally looked, before it became overgrown. The people who built Newgrange (and it must have taken at least three generations of work, according to our tour guide) hauled white quartz to cover the face of the burial mound. It’s beautiful. The inside was so small. People had carved graffiti into the rocks and I was pissed–until the tour guide informed us that none of the graffiti was younger than 100 years. It’s 1700s-1900s graffiti in there! I added my name to a drawing so hopefully I can be one of the 80 people chosen to enter Newgrange on the five days surrounding the winter solstice. I’d be able to see the sun rise and shine through the passageway, illuminating the interior space. The tour guide said it was like the stones were lit from the inside and, huge dork that I am, I was immediately thinking CASTLE IN THE SKY, MIYAZAKI, OH MY GOD. I doubt it’s like that, though. 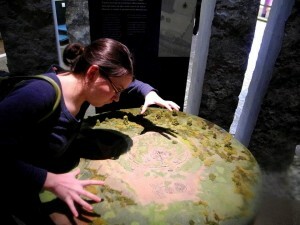 And then I ate Newgrange (thanks for the pic, Carly). 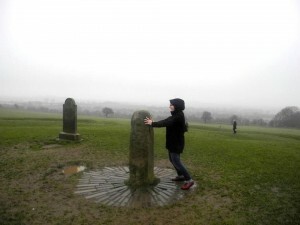 After Newgrange, we took a bus out to Hill of Tara. My hands were frozen by this point because the misty rain was intense, so all photos are courtesy of my friend Carly. 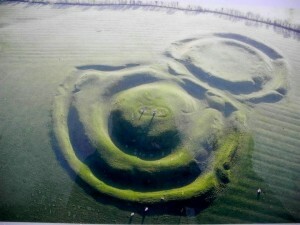 The Hill of Tara is the seat of kings. You couldn’t walk a kilometer without tripping over a king back in the good old Celtic days, but all the petty kings got together and decided on a High King, who lived and was crowned at the Hill of Tara. it’s just a lot of hills and ditches and sheep poop. A lot of fun to run around on, though! The most awesome-sounding thing on Tara was the Stone of Destiny. It was kind of like the myth of Excalibur. If the true king touched the Stone of Destiny, it would roar. Of course I touched it. Too bad that the only roaring was me. There’s what looks like a gravestone in the background of that picture. It’s a monument set up by the IRA in honor of some rebellion that the British squashed back in the late 1600s or so. It was amazing to me how much politics have affected Irish heritage sites. I did not expect that the conflict would have made it to the Hill of Tara, but there you go. So, that’s one of my favorite learning trips I’ve taken so far. Yes, I took notes. Yes, I love astronomy (shout out to James Evans, who taught me how to use an astrolabe and showed me how difficult it is to plot where the sun’s going to end up). Yes, I went to Tara secretly because it makes an appearance in Artemis Fowl. It was beautiful despite the misty rain, and I loved learning more about the ancient history of this country.